By Kelsain, November 9, 2011 in The Workshop! I had dropped a mention of this project back in the thread about MtF. 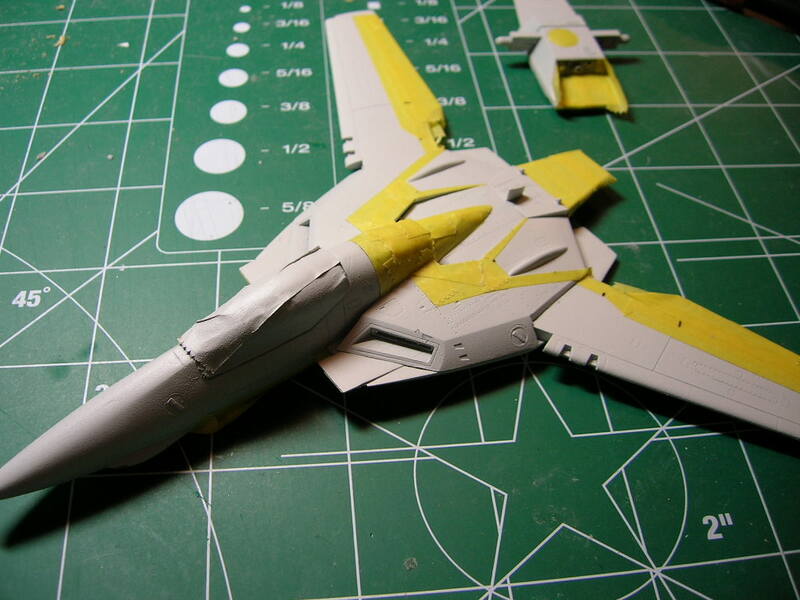 I finally decided on a paint scheme for my languishing Hasegawa VF-1A. I really like the new treatment of Hikaru's VF-1J in MtF, and I thought it would look cool on a cannon fodder brownie. Now, I've been informed that the brownies in the manga look the same as they did in the anime - but who cares?! I worked up a sketch of how it would look. So I dug everything out and primed it, then hit it with Tamiya Insignia White, while I was also painting my Regult. In retrospect, I wish I'd looked at the scheme again before I painted. As it is, I wasted a lot of white on areas that will end up brown. Oh well. I had some free time the other day to sit down and mask out the white markings. 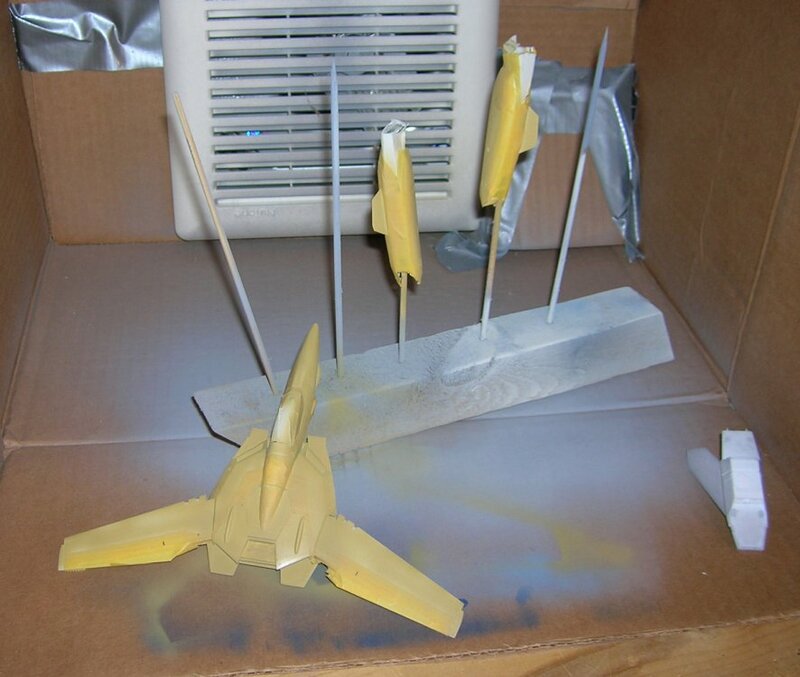 Then I had to rebuild my spraybooth, as it did NOT work as intended on the first go. But now I'm swamped with work and itching to get back down to the work table. I'd do it without fast packs. Naked fighter is where this scheme shines. I agree. 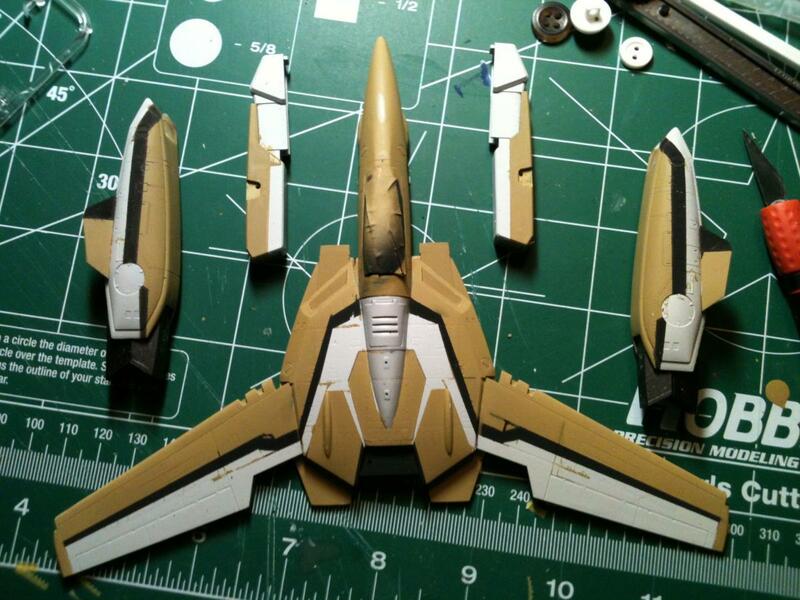 The profile of the fighter with that scheme is amazing and the fast packs completely obfuscate it. 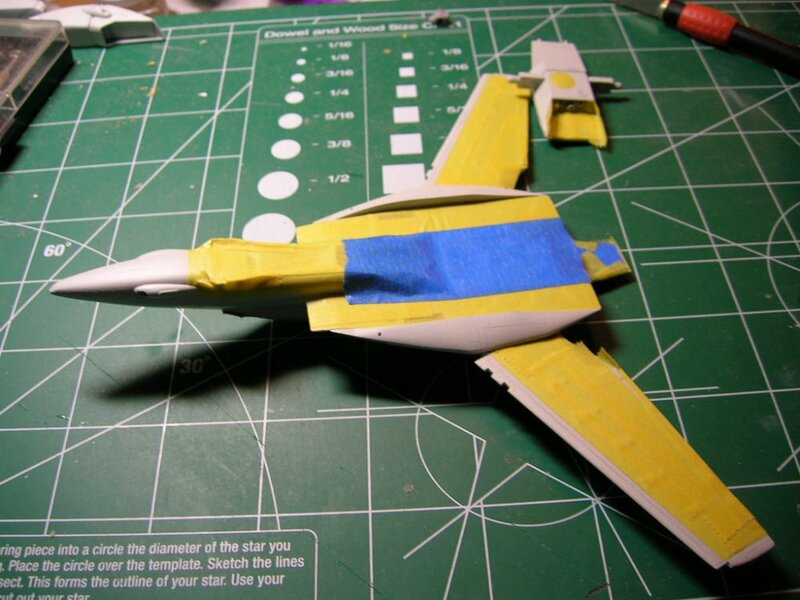 Well, I suppose I could pop the back panels required for the boosters off and reseat them properly for fighter. The trickiest part to change back might be the leg attachment. I agree that it looks better without the packs myself. 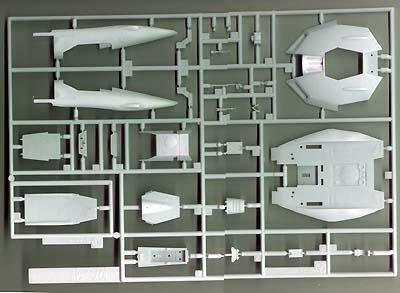 Edit: Hmmm, it would seem the Super 1A kit (DYRL Max painting on box) doesn't include the naked fighter knee piece. I always thought the alignment was a little off anyway. Nothing some superglue and epoxy can't remedy, right? Sigh, maybe I should have looked first... I decided to take your advice and do a naked valk build. Pried the backpack apart, then realized that the proper panel for a naked valk is not included in this case either... I guess I'm stuck with doing this as a super! At least all the opened seams are hidden. Ah well. Back to it, then. Don't fret it. Build it to what YOU originally envisioned, and most importantly.......enjoy it. Hasegawa's are fun! Any Updates on this build? Not lately... Freelance work picked up for a while, which is a good thing. Now that Turkey Day's behind us, I'm hoping to get in a little more time on a few projects, including this one. I'm sure it will look awesome when finished!! As Fatalist said, have fun building it!!! Can u photograph the bit u need, I'm sure I have a spare or partially built one, somewhere. Can send to you? Ooh, quite interested in fact. I still haven't been able to come up with a satisfactory fast pack scheme. Let me take a look @ the parts trees & I'll pm you what I'm looking for. Haven't heard back from SpaceMonkey yet, but if anyone's got a part C-1, the tail-mounting plate, they're not using, please let me know! Part seen here, lower left corner. Interests:Firearms, Flying, Mopar Muscle Cars (1969 Dodge Charger). MW Member since 23 Dec 2001. Sorry, I haven't had a chance to pull the VF-1D kits out to check what spares they have. However, I do know the tail mount plate is common to all the VF-1 fighter kits and the 1D did not come with a duplicate, I'll check the other parts when I get home this afternoon. 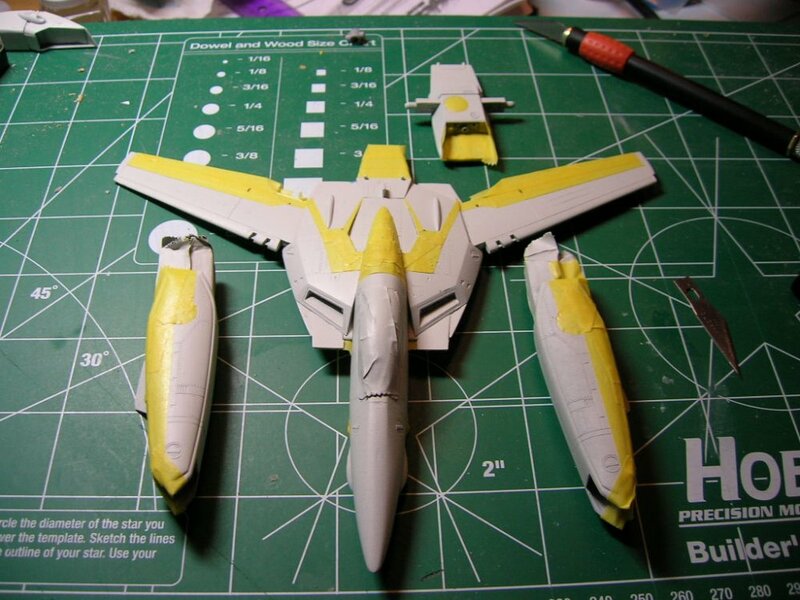 If Spacemonkey hasn't gotten back to you, I know I have at least one VF-1A kit still. Let me know if you need the parts still. Shout out to Capt Hungry for hooking me up! Updates will be forthcoming. Sweet, back to the bench to continue with that beauty. Finally got a chance to do a bit more work in the dungeon! Today I attempted to use my $5 garage sale air compressor to lay down some paint. The thing doesn't seem to be putting out enough pressure... But, luckily I still had a couple Badger cans laying about, so I started applying the first coat of brown. I'm still getting some of the std fighter pieces in place, so I couldn't get everything tonight, but it's progress! Edit: Couldn't sleep this morning, so I got another coat of brown on this sucker. I finally got another chance to get downstairs and do some more airbrushing. After an hour or so, I couldn't wait to take off the tape! There's a few spots where the paint bled under the tape, a few doofy over-sprays, but easily fixed. Whoops, forgot to attach the pic! It's looking awesome!!! 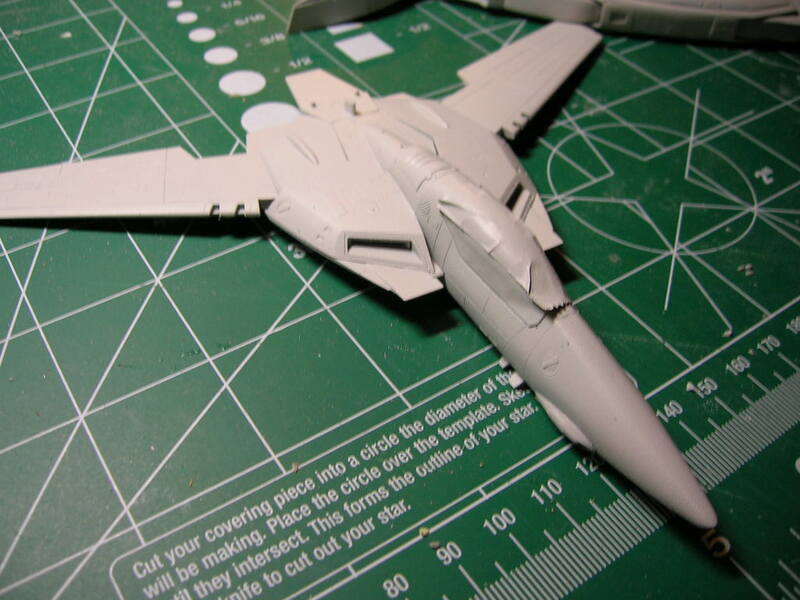 Great scheme, suits the VF-1A very well. Thanks! I'm just touching up by brush, hopefully the future evens out the finish. I wish insignia white came in bottles. I'll have to spray some in a cup for those spots. I also have to order some decal paper. I dig this scheme a lot more than the Hikaru 1J that I keep seeing. Props to you! 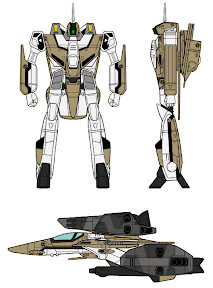 Have they shown any other schemes in Macross the First yet? Like Max, Roy, Millia.......anyone? Obviously I'm not keeping up on it. I've finally gotten back to the table for a while. I was having some issues touching up the lacquer white over acrylic brown. Apparently I'll need to give it a coat of future before proceeding further. More soon, hopefully. This is inspiring! Would you mind terribly if I applied a similar scheme to a spare CF-1A I have? Seems to be my biggest hurdle in modeling. Ok, now it's the toddler, but that's only a recent condition. looking good...cant wait to see it all done! Some day this parade of house guests will end and I can get back to the hobby table without being rude. Now that I know how to fix my paint interaction problem, I'm itching to finish this bird. Can't wait seeing it finished, it will look great!!! !